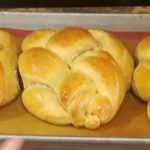 I have been trying to make whole wheat challah using fresh milled flour for years with mixed success. I have decided to start from scratch with a new recipe and make systematic modifications. The base recipe I will be using is here. For my first attempt, I made the recipe mostly as directed and found it to be basically good, but not sweet enough. Here is my plan for next time. Switch to dough hook and mix at speed 2 for 12-14 minutes. Turn dough onto floured surface and kneed by hand until it passes the window test. Put dough in greased bowl and cover with plate. Let rise 60 minutes or until doubled in bulk. Overnight modification: Put dough in greased bowl and cover with a plate. Put in fridge overnight. When ready to continue, take out of fridge and let sit on counter for 30 minutes or until doubled. Turn the dough onto a lightly floured surface. Punch down and divide into 12 equal sized balls. Cover them with a damp towel and rest for 30 minutes. Roll each ball into a long snake. 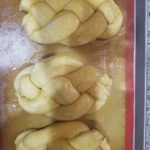 Braid 4 snakes into a challah. This will result in 3 medium loafs. Bake until it reaches an internal temperature or 195 F. About 25 minutes. rotate half way though. Areas for experimentation: hard red vs hard white flour, honey and egg quantities, rising and overnight.